Have you ever just wanted to get back to 'normal,' but your schedule just doesn't allow that to happen?! I have had the best intentions to blog all week, but seriously, life happens! We got a call late Sunday that Joe would be out of town, and he ended up leaving at like midnight. On top of him being out of town, I have had a MAJOR weekend on the volleyball front, and my babies have been troopers with the later than usual nights! 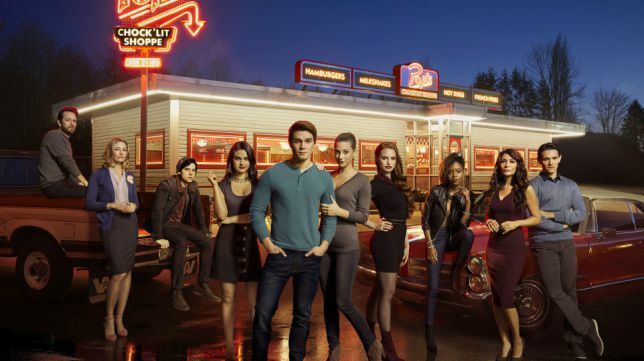 All the Riverdale: Season 2! If you are looking for a cheesy, silly teen-drama, then binge watch this now! 95% of the episodes are completely outrageous, but I can't stop watching! Moca Java & Candlelight for concealer and contour! These two together are complete game-changers! And this is better than any blush/bronzer I've ever used! Silver Rose Dust is the most perfect cheek/face color ever, and the easy applicator makes life so dang easy! I don't personally sell any of these products, but I've quickly become obsessed with them. They have become more than just favorites. They are my must-haves!! Fall temperatures to get here asap! Give me all the layers & less sweating soon, please. A vacation, which reminds me that we leave for NAM Nationals in less than 60 days! We are literally jumping for J-O-Y because we will be Los Angeles-bound soon! And while I'm sharing, I just have to share another sweet picture from Nataleigh's photoshoot at her State Pageant. All that SASS in a tiny little girl! This little nugget of TRUTH!! I shared this on my Instagram page, and I just couldn't help but be reminded of the wonderful friends that are in my life now. Be that woman who lifts up, not tries to tear down, other women! Oh my mischievously wonderful middle man! I only snuck this picture because he wanted to show off his new jacket, and y'all, I jumped all over the chance to snap it! He's kind, beautiful, funny, loving, and smart. He is a good, good friend, and he's the best big & little brother combined. It's getting ever more difficult to convince my handsome boys to let Ole Mama grab their picture, but I treasure these moments so much! Handsome boy, God has big plans for you & your beautiful life! Thank You, Lord, for giving me this wonderful boy! I am closing in on the end of another season of volleyball, and I'll likely be sporadically posting here for the next couple of weeks. Such a fun recap and life is so busy! Oh I am dying for Riverdale to start season 3. Lollipop will never sound the same to me..ever! !